"I shall transform you into a vampire!" declared the Vampire Lord, magically changing the red-haired zombie into the Vampire Lady. "You taste funny," he said while draining Justine of her blood. "That's what she said," said Justine, losing her blood. Justine's blood, in turn, transformed the Vampire Lord into a human. "Son of a..." he said, upon this realization. So this is sunlight, the Ex-Vampire Lord thinks. "Check out the dude in the cape," the daytime werewolf tells his reptilian companion, unaware that this is the same (former?) monster he dueled just hours before. That night, the Ex-Vampire Lord meets the Vampire Lady. He wears sunglasses to hide is non-vampire green eyes. "What's with the sunglasses at night?" she asks with suspicion. "What's with the extra-large T-shirt?" he replies with a question. Notice the once-regal Ex-Vampire Lord speaks with contractions. "Touché," the Vampire Lady admits...suspiciously. 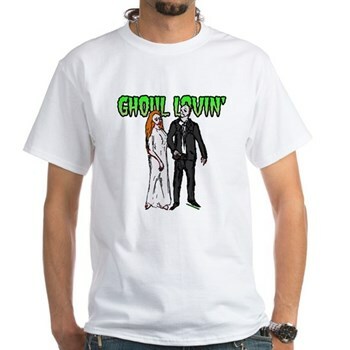 Wear the same shirt the Vampire Lady wore: Ghoul Lovin'!